The following image of Jupiter and two of its moons was captured by Adrian Brown at 22:08 UT on Sunday, 25th April 2004. It is a stacked composite of the best 200 frames out of 500 taken with an ATK-1C web cam through a Celestron CGE-11 f/10 Schmidt-Cassegrain telescope. The moon Io is at upper left while Europa is near the right-hand edge of the frame. Io shows a distinctly orange colour in keeping with its surface geology of sulphur rich lava flows. The shadow of the moon Ganymede is visible on Jupiter, although the Moon itself cannot be seen against the background of the planet in this image. A wealth of structure and colour is evident in the cloud belts. 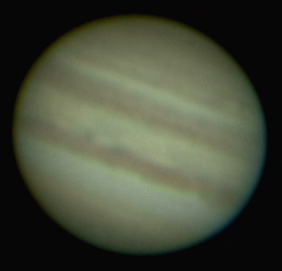 The following three images of Jupiter were captured by Adrian Brown through his Celestron Nexstar 5 using an ATIK Instruments ATK-1C camera and a 2x Barlow lens on 17th March 2004 at around 20:40 UT. The camera is a modified Phillips Toucam designed to take long exposure photography. A white oval is visible in one of the main cloud belts, highlighted in the right hand image. 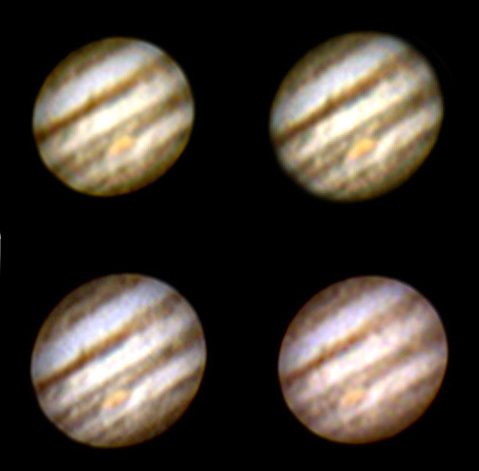 Four images of Jupiter processed by Graham Ensor from a stack of 150 AVI frames shot using a Phillips Toucam around 00:00 UT on 1st-2nd March 2004 through Mike Dumelow's 8-inch Dall-Kirkham reflector. The images were additionally enhanced in Adobe Photoshop. 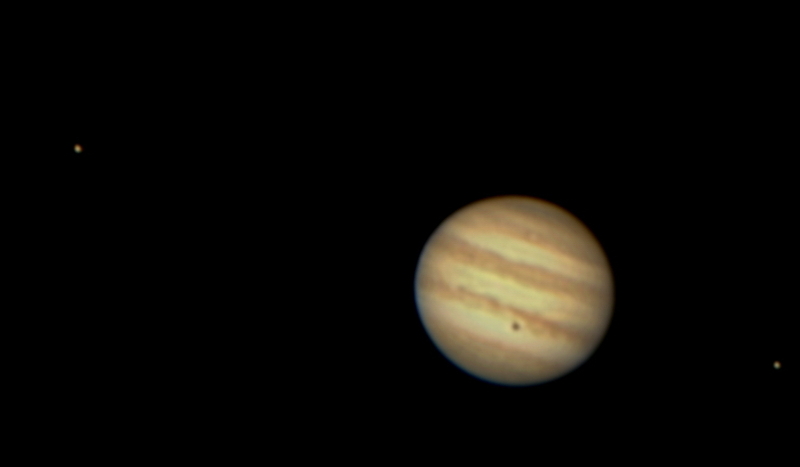 The Great Red spot is clearly visible, as are some smaller storms around it and much structure in the cloud belts. 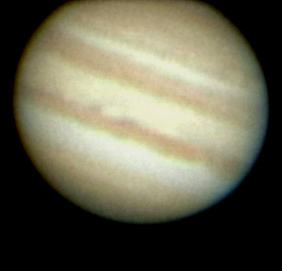 The following image of Jupiter is composed of a stacked set of video frames shot by Graham Ensor through the Society's 10-inch Newtonian reflector at the Flamsteed Observatory on the night of 16th-17th January 2004. Mike Dumelow provided a specially constructed eyepiece which fitted between the telescope and Graham's Panasonic DV camcorder. The image was stacked by Graham using Registax software and further processed in Photoshop to bring out detail. The cloud belts are clearly visible. The above image is a normal contrast view of a section of the wider frame shown below, in which the image brightness has been increased to show the moon Europa at left. Ganymede can also just be seen emerging from behind the planet in the 8 o'clock position (it appears as a bump on the limb of Jupiter).